Britain was left without a player in the French Open singles after Tim Henman lost 6-4 6-3 6-2 to Latvia's Ernests Gulbis in the first round. Henman, who has slipped to 53rd in the world, was never able to get his game going against an 18-year-old ranked 84th and making his Grand Slam debut. Gulbis produced a nerveless display and broke in the 10th game go one set up. He broke again in the second and although Henman had a break of his own in the third, Gulbis was too good. The defeat is another setback for the 32-year-old British number two, who has won only once on tour in an injury-hit season but he has dismissed any talk of retiring. "It would be easy to throw in the towel but it does not enter my mind," he said. "When you come to analysing things, you can either give up or work through these things. There is no magic secret. You just have to get on with it. "I have to find a way of replicating my practice form into a match. That's easier said than done. "But there's still a lot of excitement and expectation there. And I still enjoy competing. I will keep working but confidence is an issue." Henman, who has not reached the third round of a Grand Slam event since the Australian Open in 2005, started solidly enough but the signs looked ominous when he blew a 40-0 lead on Gulbis' serve in the fifth game. Gulbis, playing in only his 14th match at Tour level, had bags of confidence and was far from intimidated by appearing on the Roland Garros stage for the first time. 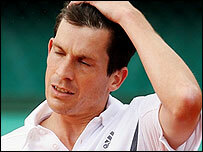 He attempted a whole variety of shots and broke Henman to love in the 10th game to take the opening set. The Latvian never looked back and was able to hold serve despite Henman having chances to claim breaks of his own in the second. A Gulbis break in the sixth game was enough to take the second set and Henman lost his serve again in the first game of the third set to put the Latvian firmly in control. Henman claimed his first break in the very next game and looked as if he could get back into the contest only to lose his serve three games later thanks to an error-strewn display. Gulbis soon stretched the lead to 5-2 as Henman's attempt to serve and volley backfired before holding to love to seal a comprehensive victory.